Patients and Methods: Presurgical patients received a detailed explanation regarding the technical aspects of each surgical tecahnique: open surgery, conventional laparoscopic surgery, SPES and NOTES, including the challenges and potential advantages. Benefits, risk, potential complications, cost involved and clinical data from the published literature were part of the information. 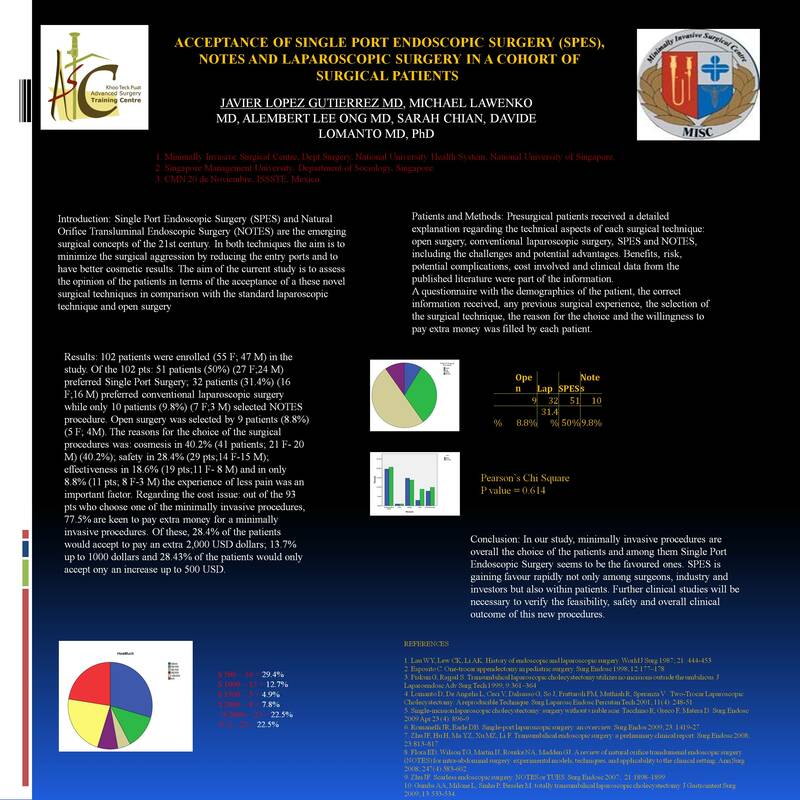 A questionnaire with the demographics of the patient, the correct information received, any previous surgical experience, the selection of the surgical technique, the reason for the choice and the willingness to pay extra money was filled by each patient. Results: 102 patients were enrolled (55 F; 47 M) in the study. Of the 102 pts: 51 patients (50%) (27 F;24 M) preferred Single Port Surgery; 32 patients (31.4%) (16 F;16 M) preferred conventional laparoscopic surgery while only 10 patients (9.8%) (7 F;3 M) selected NOTES procedure. Open surgery was selected by 9 patients (8.8%) (5 F; 4M). The reasons for the choice of the surgical procedures was: cosmesis in 40.2% (41 patients; 21 F- 20 M) (40.2%); safety in 28.4% (29 pts;14 F-15 M); effectiveness in 18.6% (19 pts;11 F- 8 M) and in only 8.8% (11 pts; 8 F-3 M) the expereince of less pain was an important factor. Regarding the cost issue: out of the 93 pts who choose one of the minimally invasive procedures, 77.5% are keen to pay extra money for a minimally invasive procedures. Of these, 28.4% of the patients would accept to pay an extra 2,000 USD dollars; 13.7% up to 1000 dollars and 28.43% of the patients would only accept ony an increase up to 500 USD. Conclusion: In our study, minimally invasive procedures are overall the choice of the patients and among them Single Port Endoscopic Surgery seems to be the favoured ones. SPES is gaining favour rapidly not only among surgeons, industry and investors but also within patients. Further clinical studies will be necessary to verify the feasibility, safety and overall clinical outocome of this new procedures.